All of our ciders are available sparkling in 330ml bottles (individually or in six packs) and draft (still) in 10L and 20L bag-in-box containers. Visit the farm to try our whole range. All of our ciders are produced using traditional craft methods: our Organic Gasping Goose and our Panting Partridge Pear Perry are our way of paying tribute to the fantastic ciders that have been coming out of Herefordshire for hundreds of years. Once in a while Paul decides to make something special. 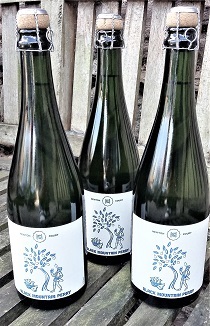 Strictly limited edition, these bottle conditioned ciders represent the best of Herefordshire organic cider. The Black Mountains overlook Herefordshire's red soil, famous cattle and sprawling orchards where Perry pear trees bear their fruit. Perry's uniquely sweet yet astringent taste has been enjoyed at special occasions for many generations. An award winning, well balanced, golden medium bodied craft cider made with organic apples grown to Soil Association standards in Newton Courts orchards. Made with Perry pears handpicked by Pauls cousin from orchards from Yarkhill to Much Marcle. Medium with a juicy pear taste and delicate wine finish. This is our most adventurous cider: it's the product of a round-the-world adventure to find the cleanest, crispest and smoothest cider making techniques. We don't think there's anything better on a summer day or at a BBQ (also did we mention it's our favourite mulling cider?). Our cider and Perry comes sparkling in 330ml bottles or draught 10litre and 20litre Bag in Box. These are idea for parties and gatherings and need no extra attachments- just open and pour! Trade enquires welcome - we also have 30l Dolium kegs of sparkling cider and Perry.